TIP: Not all people who are sensitive to wheat gluten can tolerate oats. If you have questions, please speak to your doctor or dietitian. TIP: For more citrus flavour, add the zest (but not the juice) from a second lemon. Preheat oven to 350 degrees. Grease a single square or round cake pan. TIP: Double the recipe to make a layer cake. This would be fabulous with a layer of custard or jam in the middle! In small bowl, combine the sour cream, milk, egg, and vanilla. Make a well in the dry ingredients and add milk mixture. Stir until combined. Zest and juice the lemon and add to bowl. Stir to combine. Pour into your greased cake pan and bake for 25 – 30 minutes or until a toothpick inserted in the centre comes out clean. Serve as is or frost with your favorite gf icing. The one in the photo is smothered in vanilla icing and sprinkled with yellow tinted coconut. If you would like more recipes from gfandme.com, you can “LIKE” us on facebook, follow us on pinterest, or sign up to follow our blog by email or RSS feed (on the left hand side of your screen)! 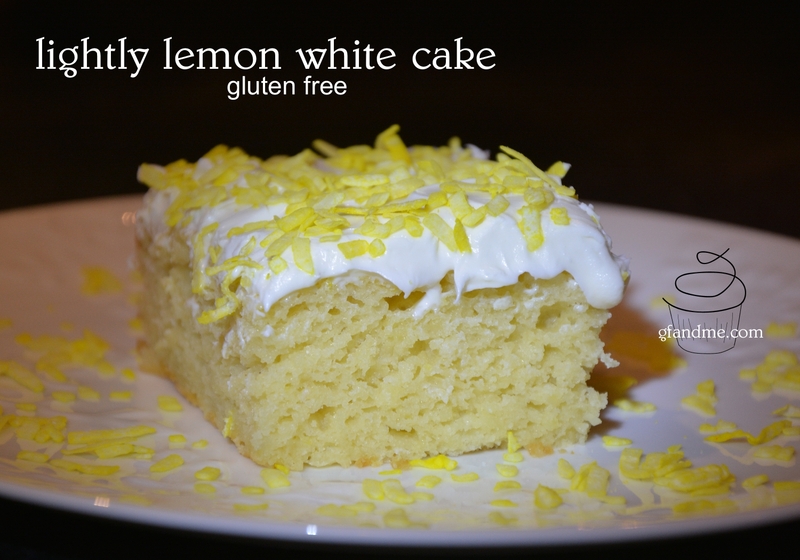 This entry was posted in Baking, Recipes and tagged almond flour, Cake, gluten free, oat flour. Bookmark the permalink. Thanks! Yellow is one of my favorite colours! What other flour can be used in place of the oat flour? I would try tapioca or corn starch. They would also act to lighten the flour mix. If you try it, please let us know how it works. Wow this looks fantastic! I’ll give this a try! Thank you. Do I use tapioca flour or starch. She cannot use cornstarch. I will not be making the cake until the weather gets warmer. I have a problem with cakes when it is so cold and damp at 6,300 ft.